Ralph Waldo Emerson (1803 - 1882) was an American poet, essayist, and philosopher. Born and raised in Boston, he attended both Harvard University and Harvard School of Divinity, but was not a particularly impressive student. "Waldo,” as he preferred to be called, worked as a schoolteacher and Unitarian minister before devoting himself to a career in writing and public speaking. A close friend of Henry David Thoreau, Nathanial Hawthorne, the Alcott family, and Napoleon Bonaparte's nephew, Prince Achille Murat, he was also instrumental in establishing Walt Whitman's reputation as a poet. 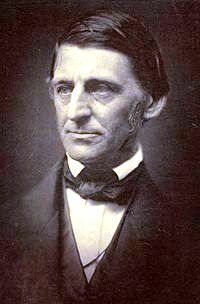 A strong abolitionist and passionate Transcendentalist, Emerson was one of the foremost personalities of the 19th century; his philosphies and writings had tremendous impact on America's political, religious, and literary arenas. Unfortunately, he knew much sorrow in his life, including the death of his father when he was only eight, the death of his first wife after only a year and a half of marriage, the death of both his young sons, and the loss of his home in Concord to fire.